Place snow peas in a microwave-safe bowl with a splash of water and microwave for 3 minutes. Drain and set aside. Liberally coat a large skillet with oil spray and warm over medium-high heat. Add chicken and cook for 5 minutes, flipping halfway through, until slightly browned on each side (chicken does not have to be cooked through). Add garlic to skillet with chicken and sauté for about 30 seconds. Add rice vinegar, soy sauce and hoisin sauce and sauté for another 1 to 2 minutes, until thick and brown. Add snow peas and sesame oil and sauté another minute. 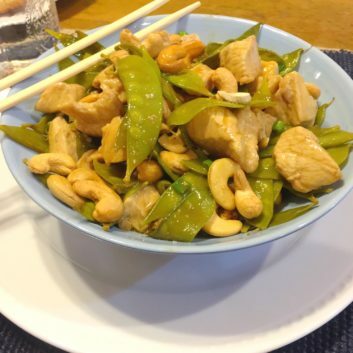 Mix in scallions and cashews. Season with salt and pepper to taste.